I should probably first admit that I don't really know enough about Prog and the Canterbury scene to fully try to digest an artist like Robert Wyatt. No, in fact, it wasn't until last year that I actually delved into a few of Wyatt's solo releases (with the joy that Comicopera was), and I've loved most of the Soft Machine's albums for years. Shleep is an excellent release in a pretty spotty discography, sounding very akin to a 70s ers Brian Eno record. The title of the record is apt, as it provides a great, hazy, beautiful, dream-like quality and atmosphere that is constructed around what are pretty decent pop songs. This record was not recorded in the 70s (though Eno did help), but it was recorded in 1997. Anyway, it's a nice listen. Experimental and out there, but not nearly as bracing as much of his other work. It serves as a good introduction to an otherwise hard musician to digest. Robert Wyatt was the drummer and founding member of the Canterbury, England based Soft Machine, who played arty, psychedelic, Pink Floyd-influenced jazz-rock fusion. Although his output has been spotty and sporadic, he has been revered for escaping the syrupy art-rock pretentiousness that his colleagues drowned in. Like Captain Beefheart, Wyatt has maintained a playfully unselfconscious experimentalism that may make for difficult listening, but is never boring. Shleep is a welcome comeback which, on first listen, reminded me of an old Brian Eno album. Sure enough, the booklet revealed that Eno did indeed arrange the first song, "Heaps of Sheeps." He also plays on two other songs. Wyatt's high, fragile voice is also similar to Eno's. 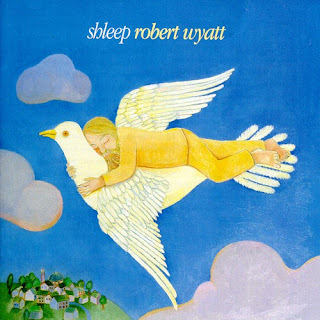 Like this album, Wyatt's mid-70s solo albums, Rock Bottom (1974) and Ruth Is Stranger Than Richard (1975), mined the same cracks found between pop, art-rock and the avant-garde as Eno's post-Roxy Music solo albums of the same era. The main difference on Shleep is that the music is a gentler, prettier version of the old Wyatt, who could at times be abrasive in both sound and his ruthless politics. His lyrics are not all flight and whimsy, however. "Free Will and Testament" and "Blues in Bob minor" show that his politics have only grown more subtle in his old age, making more timelessly powerful songs in the long run.